“Some of the most disturbing prison conditions we have ever seen.” That was the verdict of the 2017-18 annual report by the Prison Inspectorate covering England and Wales. More than 80,000 men and women are crammed into squalid cells, often for 22 hours a day, in prisons crawling with rats and cockroaches, full of broken glass, exposed wiring and overflowing toilets — conditions in which even animals cannot legally be kept. The report gives a small window into the lives of prisoners. They are beaten, terrorised and strip searched; denied medical care and fed (or starved) on £2 a day. Her Majesty’s dungeons express in concentrated form the organised violence upon which this nasty, racist, capitalist society depends. As Marxists, we support any amelioration of the horrific conditions for those locked behind bars and barbed wire. However, we understand that the prisons cannot be reformed into humane institutions. They are part of the machinery of capitalist state repression, whose core is the police and the army. The fundamental function of the capitalist state is to maintain through force or threat of force the rule and property of the exploiting class. The brutal and dehumanising conditions of imprisonment serve only to further degrade those deemed criminals by this predatory society. In fact, the world of lumpen crime merely reflects on a small scale the “ethics” of the big bourgeoisie. As the murderer Macheath says in Bertolt Brecht’s Threepenny opera, “What is the crime of robbing a bank compared to the crime of founding one?” The fate of the prison population is linked to the struggle of the proletariat to emancipate itself from the system of capitalist wage slavery. The Marxist attitude towards crime and punishment is that we are against it. Socialists do not proceed from the standpoint of punishing the offender. Such a vindictive attitude is fundamentally a religious rather than a materialist conception of social relations. Of course, a humane and rational society, which capitalism decidedly is not, may find a need to separate out certain dangerous individuals — for the protection of others as well as themselves. But this would be done without stigma or deprivation and with education, medical care, rehabilitation and the goal of reintegration as productive members of society. Money for guns not butter? England and Wales have the highest incarceration rate in Western Europe. The prisons are filled to overflowing with those at the bottom of society, driven out of the productive economy into a lumpen existence and/or framed up based on class, racial or religious background — including as a result of the anti-Muslim “war on terror”. Incarceration rates for black people in Britain are even more disproportionate than in the US, as a September 2017 review by a committee headed by Labour MP David Lammy reported. Black youth are nine times more likely than white youth to be banged up. Gypsies, Roma and Irish Travellers, who make up 0.1 per cent of the population, make up fifty times that proportion of the male prison population. Muslims comprise five per cent of the population, but almost 15 per cent of prisoners. The Blair Labour governments’ “tough on crime” policies produced a rise in incarceration rates, and the construction of a raft of new prisons, many run by private companies. Corbyn’s 2017 general election manifesto recycled Blair’s slogan “Labour is tough on crime, tough on the causes of crime”, and promised more prison guards, cops and immigration police. This manifesto was praised by the Labourite reformists of the Socialist Party as “an important step in the right direction” (Socialist, 18 May 2017). Trampling on the elementary principles of socialism, the Socialist Party likewise demands more money and more screws: “The prison and probation services must be fully renationalised with all staff cuts reversed, and fully funded to ensure the safety of all prisoners and workers” (Socialist, 23 August 2018). This is an obscene twist on the shopworn reformist demand for butter not guns. There may be no lower form of life than private contractors like G4S, who pad their pockets at the expense of prisoners. But whether contracted to private capitalists or directly run by Her Majesty’s capitalist government, prisons are hellholes. Overcrowding in the prisons is a result of deindustrialised Britain casting off huge numbers of the population as surplus to its needs — fit, in the eyes of the bourgeoisie, only for a cage. In particular, black and Asian youth are targeted under the “war on drugs”, for purported gang connections or for carrying a knife. Our answer to such racist witch hunts is simple: Let them go! We are against all state measures to disarm the population, which leave weapons only in the hands of the cops and criminals. We also oppose laws against drug use, gambling, prostitution and other “crimes without victims”, including mutually consensual sexual relations — down with age of consent laws! Such laws extend the reach of the state into the private affairs of individuals and help to buttress the social order by ideologically regimenting the bourgeoisie’s wage slaves. The 2017 ban on smoking in prisons cruelly deprived prisoners of one of the few reprieves they were allowed. Because prisons are a core component of the bourgeois state, the attitude of ostensible socialists on this question is a key test of their political credentials. Grotesquely, the Socialist Party has taken the side of the jailers. Many recent issues of its newspaper, the Socialist, have featured articles promoting the POA screws “union” and retailing its demands to make the prisons “safe”. The safety of prisoners is endangered by the prison guards themselves! Prison guards, like the cops, have no place in the workers movement. Police and probation officers out of Unison! 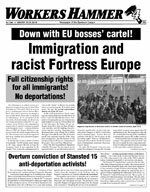 Immigration cops out of the PCS! POA out of the TUC! The fundamental purpose of the cops and the prisons is not to protect working people from crime, as the Socialist Party would have us believe, but to protect the power and profits of the capitalist class against its enemies, real or perceived — centrally the working class. That is why an army of cops flooded the coalfields during the heroic 1984-85 miners strike, and why strike militants filled up the jails. And why the Pentonville Five dockers and the Shrewsbury 24 building workers were locked up for picketing during 1972 strikes. Then there are those who were “innocent until proven Irish” — like the Guildford Four and the Birmingham Six, framed up for pub bombings the cops knew they did not commit. Bobby Sands and nine others starved to death in 1981 on hunger strike fighting for Irish Republicans at Northern Ireland’s notorious Maze Prison to be recognised as political prisoners. Shamelessly, in 2008 the Socialist Party hailed a campaign by airport security guards — adjuncts of the capitalist state. One of these, Madan Gupta, had previously been a prison guard at the Maze during the hunger strike. Iain Dalton of the Socialist Party’s national committee has written a pamphlet hailing the 1918-19 cop “strikes”, outrageously titled “Never nearer to Bolshevism” — The police strikes of 1918-19 (2018). Dalton enthuses: “Even at Special Branch, 25 sergeants and 16 constables joined the strike!” This is the very agency dedicated to spying on and persecuting militant trade unionists and leftists, including the Socialist Party! Inspired by the October Revolution in Russia in 1917, a wave of working-class struggle swept Britain after World War I. In reviewing his own book for the Socialist (30 August 2018), Dalton claims: “Nothing terrified the ruling class as much as the thought that the very ‘armed bodies of men’ making up part of their state machine — the police and army — could become infected with the revolutionary malady.” What a perversion of truth! The cops knew they were well placed to demand better terms for their services to the ruling class in suppressing the “revolutionary malady”. They had been busy arresting strike leaders, confiscating socialist literature (including 10,000 copies of Leon Trotsky’s pamphlet War and revolution), disabling printing presses and attacking protests. The Socialist Party wilfully obscures the difference between police — who voluntarily hire themselves out to terrorise blacks and minorities, smash picket lines and otherwise violently defend capitalist class rule and property — and soldiers, who are used as cannon fodder in the capitalist rulers’ wars abroad. In conditions of revolutionary turmoil, it is possible and necessary to split the base of the army away from the officer corps; but the police must be swept away altogether. Contrary to the Socialist Party’s frequent assertions that the cops are working-class lads, as professional strikebreakers the cops fall outside the social relations of the process of production, regardless of their social origins. They are neither workers nor any part of the working class. As Trotsky put it in “What next?” (1932): “The worker who becomes a policeman in the service of the capitalist state, is a bourgeois cop, not a worker.” Every trade union member who’s been done for defending a picket line, and all the black and minority youth who’ve had their heads bashed for walking down the street, know what “militant police action” means. The Socialist Party’s attitude towards the forces of state repression is not some bizarre accident. The Socialist Party is a descendant of the Militant tendency. Buried for decades in the Labour Party, Peter Taaffe’s followers adapted to their host. Taaffe argues at great length in “The role of the state”, printed in The state: a warning to the labour movement (1983), that socialism can result from electing a Labour government. Following a parliamentary vote, Labour would supposedly proceed to nationalise the commanding heights of the economy (and grant compensation based on “proven need”, apparently for those capitalists who fear being forced to live by their own labour). Of course, this pipe-dream has nothing to do with the Labour Party’s real programme or practice. This political bacillus has a name: reformism. Despite their (selectively) quoting Lenin by the bucketload, the Socialist Party’s programme is for the working class to take over the existing bourgeois state through bourgeois elections. This is the same programme that Lenin targeted in his scathing polemics The state and revolution (1917) and The proletarian revolution and the renegade Kautsky (1918). In The state and revolution, he quoted Marx’s assertion, based on the experience of the Paris Commune, that “The working class cannot simply lay hold of the ready-made state machinery and wield it for its own purposes.” As Lenin explained: “The ‘special coercive force’ for the suppression of the proletariat by the bourgeoisie, of millions of working people by handfuls of the rich, must be replaced by a ‘special coercive force’ for the suppression of the bourgeoisie by the proletariat (the dictatorship of the proletariat).” This was what the Russian workers and peasants, under the leadership of the Bolshevik party, did in October 1917. After the October Revolution, the Bolshevik-led workers in Russia were determined that the penal code of the new proletarian dictatorship would not be based on the principles of retribution. The 1919 Bolshevik programme described the fundamental alteration that had taken place in the penal code, “introducing conditional sentences on an extensive scale, applying public censure as a means of punishment, replacing imprisonment by compulsory labour with retention of freedom, and prisons by institutions for training, and establishing the principle of comradely courts” (quoted in EH Carr, Socialism in one country, 1924-26, vol 2 ). The struggle to consolidate Soviet power required defeating the forces of internal counterrevolution and imperialist invasion. The war against counterrevolution was understood as a temporary episode requiring temporary, drastic measures, including revolutionary terror. In contrast, the Bolshevik penal code was a more permanent feature of the proletarian state. Following the failure of the 1923 German Revolution, with the impoverished Soviet workers state isolated and exhausted from years of imperialist war and civil war, a bureaucratic caste represented by JV Stalin usurped power from the working class through a political counterrevolution beginning in 1923-24. The perspective of world revolution gave way to the narrow, nationalist dogma of “socialism in one country”; the goal of an egalitarian society to the assurance of the material welfare of a privileged bureaucratic layer. In the face of the growing contradictions within the workers state, the bureaucracy required more prisons and executioners. By the late 1930s a whole generation of revolutionaries from Lenin’s time had been eradicated. Nonetheless the social foundations established by the October Revolution remained in place. Until capitalist counterrevolution in 1991-92, we stood for the unconditional military defence of the Soviet workers state against imperialism and internal counterrevolution and for workers political revolution to oust the Stalinist bureaucracy. The Socialist Party’s forebears in Militant rejected this perpective whenever it was concretely posed, finally standing on Yeltsin’s barricades of counterrevolution in Moscow in 1991. The perspective of Marxists is to do away with the whole system of crime and punishment, together with the capitalist prisons and the rest of the bourgeoisie’s repressive apparatus. Reorganising the world economy on a planned basis to serve the collective needs of humanity is the necessary prerequisite to establishing a communist society where crime and punishment have become relics of a barbaric past with no place outside the history books.